Cavities and tooth decay can be extremely painful and will only get worse as time goes on. This is one of the reasons why it’s important to contact a dentist if you have tooth pain so it can be fixed by a simple filling instead of a more intensive and expensive procedure. Many cavities and tooth problems can be solved with a filling if they are caught early enough. When a tooth is damaged due to decay, it’s important to remove the decay and get the tooth back to its original form and shape. This is often done through a filling. Dr. Ed or one of his associates will remove the decaying materials and clean the area. Once the tooth is free of decay, he will fill the area with the filling materials to replace the missing tooth area and protect it from further decay. There are several types of fillings available and each has their pros and cons. If you want some bling in your teeth, then you can go with gold fillings. 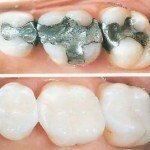 As you can guess, gold fillings are expensive, but gums tolerate gold well and have been known to last 20 years or more. It’s a sturdy material, but along with cost, it also doesn’t match the tooth color. 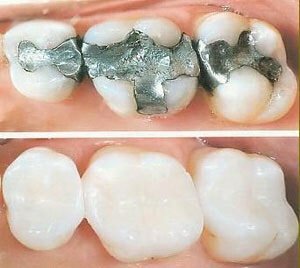 Silver fillings are less expensive and are good at resisting wear and tear, but they are very noticeable, so they are avoided for visible tooth areas. Plastic composite resins can match the natural color of your teeth, but they can chip and wear over time. Plastic resins can last anywhere from three to 10 years. They also can be stained by coffee, smoking, etc. Porcelain inlays bond to the tooth and are resistant to staining and wear and tear. They are about the same cost as gold fillings. Dr. Ed Monroe and his staff will let you know if a filling is the best choice or if a crown or other procedure is needed. If you’re having tooth pain, don’t wait and set up an appointment today. A Lifetime of Smiles can stop the pain, so contact us now.